Last month I took part in the Outlaw triathlon is a long distance triathlon which is 2.4 miles (3.8km) Swim, 112 miles (180km) Cycle followed by a marathon (26.2 miles 42.2km). The race is based at Holme Pierpoint in Nottingham and the surrounding countryside. The swim is just 2 lengths in an international rowing lake. This did not stop the kicking and hits I was getting for the first few hundred meters or at the turning buoys. On the way back section of the swim I had to slow down a bit to let a flock of geese swim across the lake about 10m ahead of me. I was then able to pick up my pace at this point of the swim and felt really good at the end, perhaps I could have pushed a bit harder earlier. For the swim I completed it in 1:23:19 which was 32 seconds quicker than the previous year. In T1 I saw my brother who was still getting his wet suit off, we were both in shock as I am normally not that close to him on the swim. He then got a few minutes on me as I took a bit longer to prepare for the cycle. On the cycle I had left the mount point when I realised I had not fully tightened my handlebars after transporting it to the race. Strange I did not notice this pushing the bike to transition but was only apparent when riding the bike putting some pressure on them. This took me a few seconds to correct and head out on the bike. The first section was a loop around the lake on the footpath before heading out on the roads for a mile U turn to get the distance up. At this point I saw my brother who was about half a mile ahead of me but this took me to about 13 miles to catch him up and over take him. There was about a 20 mile out section to the start of the 3 laps. I was able to use the aero bars a lot which helped my speed in this section. Within the first mile of the loop there was a nice 12% incline luckily there was an aid station half mile from the top. The next few miles were fast on the way in and through Southwell apart from one sharp 90 degree bend. This reached the top section of the course which seemed to be a lot more undulating and in to a headwind, this was starting to get tough on the first lap. Once of this section I was able to speed up again before starting the next lap and the hill. When I got to the top section of the course I stopped for part of my special needs bag for some of the stuff (sports drink powder, gels and coke) I had left there. That gave me a bit of a boast on the tough section of the course. A bit further along the road I saw my brother who had pulled out of the race there 3/4 way round the first cycle lap (about 40 miles), that meant I had lapped him a lot earlier than planned. I kept up my pace until the hill on the third lap which was not pleasant but I was able to cycle up it others were walking there bike up at this point. The top section of the course was really tough at this point but I had my last bits on my special needs bag to look forward to. I then knew there was not far left on the bike with the 20 miles back to the T2, however the last 10 miles seemed to be mostly uphill and in to a headwind but I made it back in a time of 7:05:04 which an average of 15.8 mph. T2 I think I must have had a powernap as it took me twice as long as last year which was already fairly long time. However after finally leaving T2 I got some sun cream applied by a marshal as the sun had came out plus it was getting hot, ideal weather to run a marathon in!! The course is flat which is basically 4 loops of the lake and 3 out and backs along river footpath. I started of at my marathon pace and was walking through the aid stations about every 1.2 miles and was trying to be careful which things I had. There was a selection of water, High5 drink, cola, gels, jaffa cakes, crisps, banana, pieces of orange. I was alternating the gels/high5 and having water/cola with the occasional few crisps and odd jaffa cakes (as chocolate was melting). This worked until about 17 miles when muscle fatigue and over nutrition caught up with me. This meant I was walking virtually all the way from then apart from the only downhill on the course underneath a bridge and in the final 1km I managed a slow jog. I was so glad when I crossed finished line and got my medal and finishers t-shirt. A more detailed race report can be seen on my blog, including more photos and review of my GPS data. 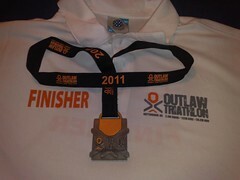 This entry was posted in Uncategorized and tagged Outlaw Triathlon by Mark S (not DK). Bookmark the permalink.